(MP289). Alma Claude Burlton Cull (1880-1931). watercolour, signed and dated. Dating the scene depicted is not easy but the painting is signed 1919 and there is no reason to believe that this was not a contemporary watercolour made by Cull on one of his many days at sea as a guest of the Royal Navy. HMS KING GEORGE V (Captain Arthur Davies RN) wearing the flag of Vice Admiral Sir Henry Oliver KCB KCMG MVO, was flagship of the 3rd BS Atlantic Fleet, a squadron of mixed classes. Apart from the flagship and HMS ERIN (Captain H W Richmond ADC RN), originally destined for the Turkish navy but swiftly commandeered by the RN in August 1914, the remainder of the squadron was composed of Orion Class ships: HMS ORION (Captain R A Hornell RN) flagship of Rear Admiral Sir Douglas Nicholson KCMG KCVO, HMS CONQUEROR (Captain J R Segrave RN), HMS MONARCH (Captain G B Powell CMG RN) and HMS THUNDERER (Captain F A Powlett CBE RN). 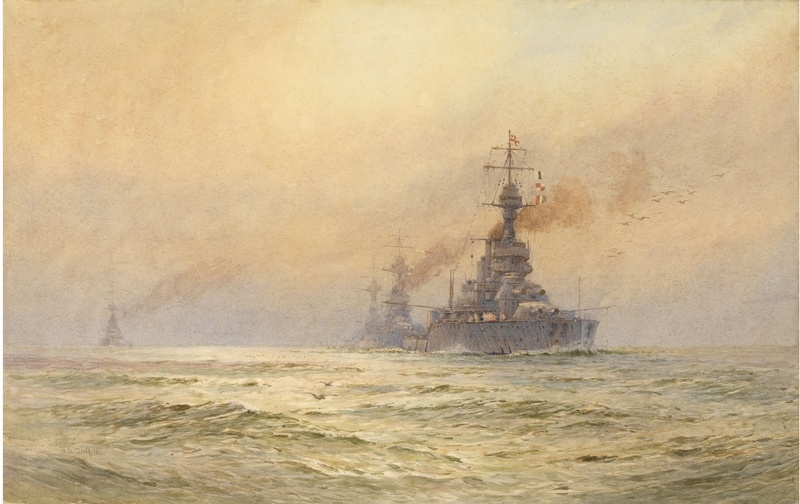 Later in 1919 and following the re-organisation of the Grand Fleet/Atlantic Fleet the battle squadrons re-formed and KING GEORGE V rejoined her surviving sisters (HMS AUDACIOUS had been sunk by mine in 1914) and still as flagship, led them to Malta where the Mediterranean Fleet was based. Here they spent the next 4 years operating in and around the Aegean, Black Sea and Crimean peninsular as well as the wider reaches of the Station until 1924 when they came home to pay off, KING GEORGE V having been relieved as Med Fleet flagship by QUEEN ELIZABETH. Cull, we know, was very much at home with this kind of watercolour: powerful looking ships, a bit of bunting afluttering, lots of dirty smoke and all set amongst superbly painted seas and skies and clouds!